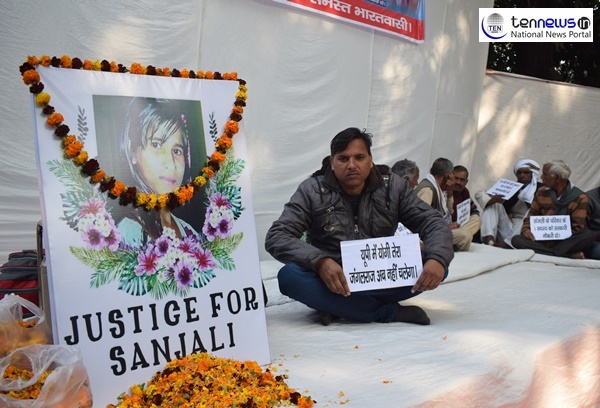 New Delhi : On this chilly winter day, over hundreds of people hailing from different cities came together to support the family of Sanjali at Jantar Mantar in New Delhi. The group accompanied by Sanjali’s family demanded financial help and CBI inquiry in the probe. When Ten News asked Sanjali’s father about the role of Yogesh ( Sanjali’s cousin brother) he denies the involvement of him in committing the crime. According to him, role of Yogesh in the happening is scripted by police , he was tortured by the police during interrogation, Yogesh found ending his life easy rather than facing his family after interrogation. The victim’s father also questioned the state government for failing to provide them justice. On December 18, Sanjali Chanakya, a 14 year old Dalit student from Agra, was set on fire using petrol by two unidentified men, one threw petrol at her back while the other one ignited the fire and both ran away after attempting the horrific incident while she was heading to her home in afternoon after school. The 14 year old girl whose body was 50% burnt, succumbed to injuries at Safdarganj hospital on December 20.